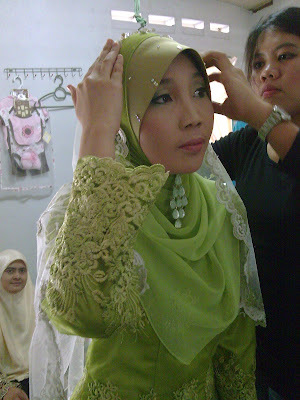 Today, 21st January 2012 is the date that my god sis have been waiting for as she will be engaged to her long-time boyfriend. We're god-sis since I was in standard 3 and she was in standard 6 if I'm not mistaken. It starts when both of us go to Sekolah Agama Rakyat which is a religious school that I have to go in the evening and Sekolah Kebangsaan in the morning and vice versa. 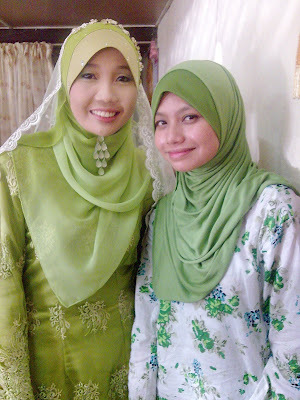 She was my senior in both schools but we became closer at Sekolah Agama. I don't even know that she is also in the same Sekolah Kebangsaan as mine. What I remember the most about her is at Sekolah Agama, we have to perform the congregational prayer for 'Asar. One day, as being me, a little kid yang sangat comot-momot, my god-sis offered to put on telekung on me and I was just letting her to. After that, we become closer and closer but it's just for a while because she went to secondary school while I'm still in primary school but we always keep in touch. Every year, she would send me an Eid card and I will reply. It continues even when she was in Technical Secondary School when she was in Form 3 and further her studies to IIUM Matriculation and finally, IIUM main campus. She will send me an Eid card wherever she is and that makes us much much closer. Luckily, I got accepted to IIUM too but she already graduated at that time. Now, it's the time for her to be engaged and I was so happy for her. I don't wanna make this entry long and below is some pics during her Engagement. 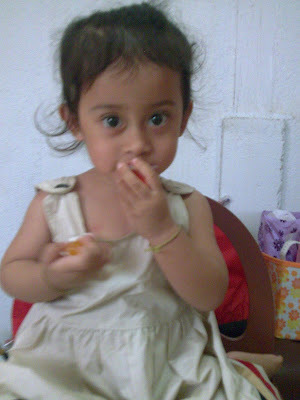 This cute lil girl kecek Klate all the time hehe.. Finally, I'm having a break after weeks of suffering from exams. I feel really really good to be home. In my previous post, I did mentioned about my intention to go to the specialist regarding to my allergic. 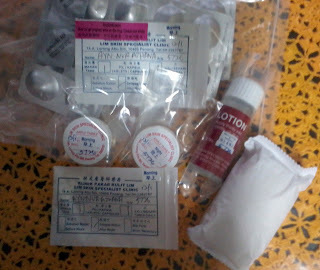 Last Thursday morning, I went to Lim Skin Specialist. It's located in Georgetown, Penang and it took me about 1 hour to reach there since I'm leaving in the mainland. I chose the clinic after I did some research regarding the best dermatologist in Malaysia and Dato' Dr. Lim Huat Bee is one of the famous dermatologist that most people being talking about. After reading the testimonials on forums and blogs, I finally decided to go there. Furthermore, one of my friends used to be his patient and it's worth it although the cost is quite pricey. Since it's my first time, I just followed the directions given by Google Maps and alhamdulillah I managed to arrived there safely even got sesat at first. Once I entered to the clinic, as expected the queue is sooo long. I've been told by my friend that the clinic is always full of patient. I also read from forums and blogs that the patient were from Indonesia and other countries just to buy the medicines for a 6 months time and it gave me more confidence that the doctor is very good. After waiting for about 2 hours, it's my turn to enter the consultation room to meet the doctor. He asked me what's my problem and I told him about my face blah blah blah and he diagnosed that my face skin is too oily and it caused the acne to popped up that much even within one night. So, it's all about the pimples not about the allergic like what it used to be. I just can't accept the fact that those were pimples but he asked me not to worry so much because it can be treated after 3 to 6 months time. It means that I need to see him once a month. 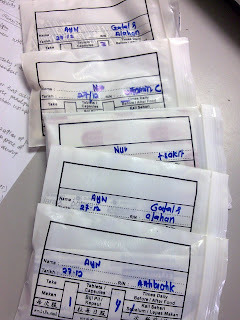 All I need to do is just be patient and take the medicine as prescribed by him. He also asked me whether I'm married or not for about 2-3 times. According to him, I must not get pregnant while taking the medicine. He said that I must stop taking the medicine 3 weeks before get pregnant and I was just laughing. I told him that I'm not even married HAHA. Then, he gave me like a card to put my sign on it to make a declaration that I must not get pregnant during the course. I must say that Dr. Lim is very nice and he's so friendly. He told me that Siti Nurhaliza used to see his friend who is also a dermatologist and I'm gonna take the same medicine like hers hehe. He then showed me 2 types of medicine to be taken everyday once in the morning. He also gave the skin care like soap, toner, morning and night cream. Mak: Muka da ok ke blm? Me: Tak pun..camtu la jugak..
Mak: Ambik masa jugak kot ubat tu..
Mak: Sabar je la..biar la kt org nk ckp ape pn jgn kesah sgt..
Mak: Kak long tak cukup tido kot dgn stress sgt ni..
Me: Sebelum ni pn stress jgk tp tak teruk camni pn..dah la makan pn pantang hari2 makan kentang n sayur je..
Mak: Laa..minum la susu bg tenaga sikit..
Me: Minum susu nanti ngantok tak boleh study..
Me: Milo pn susu jugak nanti ngantok..sekarang hari2 minum nescafe..
Mak: Laa kenapa minum nescafe? Me: Sebab tak nak bagi ngantok..dah la tak sedap paksa minum jugak..
Mak: Nanti ok la tu makan ubat tu sampai habis jgn pikir sgt pasal muka..
Me: Kalau tak ok jugak nanti org nk p specialist la..
Mak: Ikut la tengok dlu mcm mana nanti lpas habis ubat tu..k la p sambung study esok nak exam kn? Me: Em ok2 mak doakn org taw? Ayn Nur Azhana Binti Azhar Amanullah. 26 years old. A Master's Degree holder of IT and Bachelor's Degree holder of Computer Science. A cat lover and Hello Kitty fan. 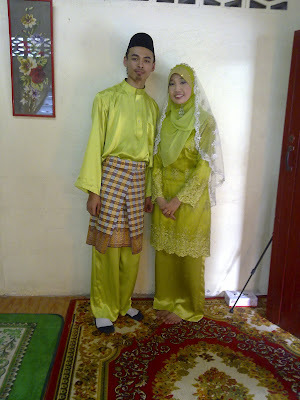 Happily married to Muhammad Asyraf. Owh nooo..pimples on my face!! 25 Random Things About Me..
Ayn Nur Azhana. Powered by Blogger.